A new miniature robot developed by EPFL researchers can swim with fish, learn how they communicate with each other and make them change direction or come together. These capabilities have been proven on schools of zebrafish. 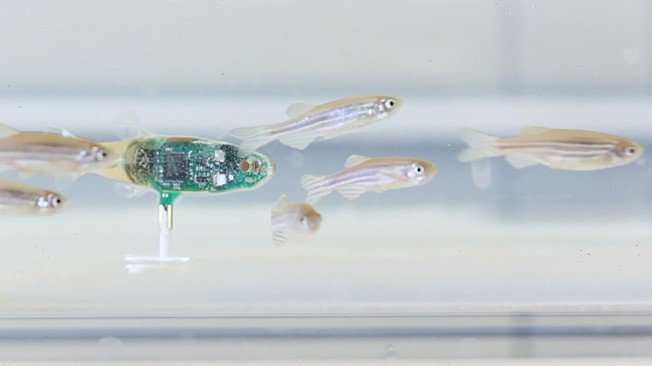 Researchers at EPFL's Robotic Systems Laboratory (LSRO), which is headed by Professor Francesco Mondada, have developed a miniature robot that can integrate perfectly into schools of zebrafish. Their work was carried out as part of an EU research program among six partner institutions, and the findings were recently published in Bioinspiration & Biomimetics. "We created a kind of 'secret agent' that can infiltrate these schools of small fish," says Frank Bonnet with a smile. Bonnet is a post-doc researcher at the LSRO and one of the study's authors. The robot is seven centimeters long – longer than the fish it's modeled after but with the same shape and proportions. It is equipped with magnets that link it to a tiny engine installed under the aquarium to propel it through the water. The researchers chose zebrafish, or Danio rerio, for their study because it's a robust species whose schools tend to switch direction and move about very quickly. There are two aspects to the research program. The first deals with biology, studying the social interactions between individual fish. Here the robot helps scientists generate targeted stimuli and test the fish's response. The second aspect deals with robotics, and this is where the EPFL researchers focused their work. First, the team determined the key criteria that would allow the robot to integrate into schools of zebrafish and subsequently influence their behavior. These included the fish's physical characteristics, like shape, color, stripes, etc. Their behavioral characteristics were also taken into account, such as linear velocity, acceleration speed, the distance between individual fish, the size of the schools, their vibrations and motion, and the rhythm at which they move their tails. The researchers also wanted to develop a closed-loop system in which the robot is able to not only influence the fish's behavior, but also adapt its own behavior by learning how to communicate and move like they do. As a result, the robot's swimming mechanism – initially designed with the help of biologists – gradually improved as the robot spent more time with the fish. The team tested their robot in different aquariums, some of which had delineated areas like little rooms and corridors. The tests involved ten schools of four zebrafish each that interacted with the robot. For each test, the researchers recorded the position and movement of individual fish, the movement of the school as a whole and the robot's propensity to integrate into the school. They then compared their results with observations made on schools of five zebrafish swimming under the same conditions, but without the robot. And their findings were unequivocal. "The fish accepted the robot into their schools without any problem," says Bonnet. "And the robot was also able to mimic the fish's behavior, prompting them to change direction or swim from one room to another." Similar studies had already been carried out at the LSRO, but on cockroaches. "Fish are much more complicated animals. To integrate into an insect community, a robot simply has to emit certain kinds of pheromones. But integrating into a community of vertebrates seems to involve many more criteria, in terms of such things as appearance, movement and vibration," says Bonnet.